Over eight hours of concentrated Candlestick chart analysis is yours for a special discounted price. The Candlestick Forum is offering 12 highly informational training CDs or DVDs for one special price. 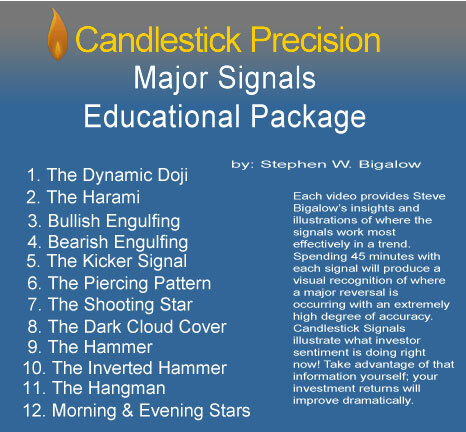 Each video ranging in approximately 35 minutes to 45 minutes in length provides Steve Bigalow’s insights and illustrations of where the Candlestick signals work most effectively in a trend. Why do the professional investors know to buy at the bottom? How do the professional investors know when to sell? The 12 major signals incorporate common sense into investment practices. Eliminate emotions from your investing. Japanese Rice traders not only became wealthy by recognizing signal patterns developed by the change of investor sentiment, they became legendarily wealthy. Prices do not move based upon fundamentals, they move based upon the perception of fundamentals. Spending 45 minutes with each major signal, learning what the Japanese Rice traders found to work an extremely high percentage of the time, will produce a visual recognition of where a major reversal is occurring with an extremely high degree of accuracy. Wouldn't you like to control your own investment future? Candlestick signals illustrate what investor sentiment is doing right now! You do not have to depend upon all the investment rhetoric available in the markets. The signals cut to the chafe. They tell you exactly what investor sentiment is doing. Take advantage of that information yourself. Your investment returns will improve dramatically. Each training CD helps in investor visually recognize a high probability reversal signal. This is not a difficult process. Simple visual patterns have produced high profit results for centuries. Learn them and use them correctly, and you will have control of your own investment future. The signals not only demonstrate what a trend reversal should occur, they also demonstrate when that new trend will be a strong trend. Wouldn't you like to be able to easily analyze where and when strong price movements will occur? That is what candlestick signals reveal. Especially the 12 major signals. Refine your investment capabilities with the most proven investment method in the world. We would not be looking at candlestick signals after 400 years of use if they did not work. They work extremely well! Learn how to use them correctly and you can extract large and consistent profits from any trading markets. This is not rocket science. This is common sense investment analysis put into a clear graphic depiction. Invest in yourself! These training CDs cut to the heart of correct investment philosophies. Achieve the the knowledge of the most ultimate investment technique. Develope a successful investment attitude by eliminating emotions out of your investment decisions. The in-depth analysis on each training CD will greatly enhance your ability to recognize high profit trade situations. Everything you need to succeed is provided an easy-to-learn format. You will learn when to enter a trade successfully and get out of a trade at the new-year optimal times. You will learn very simple stop loss procedures. And that's just the tip of the iceberg. Utilizing the knowledge illustrated in each of the major signals permits each investor to gain fresh perspectives on successful investing programs, whether stock trading, option trading, or Forex trading. See for yourself what professional investors utilize every single day. The most proven investment technique is now available to you. Eliminate many years of mistakes by learning directly from one of the most highly regarded candlestick experts in the nation. You won't be disappointed. The rewards that await you involves only a few hours of learning. Take advantage of this special offer. It will affect your profitability for the rest of your life. Want it now? Please click here to purchase download version and save on shipping.